The Dodgers finally landed their second baseman! 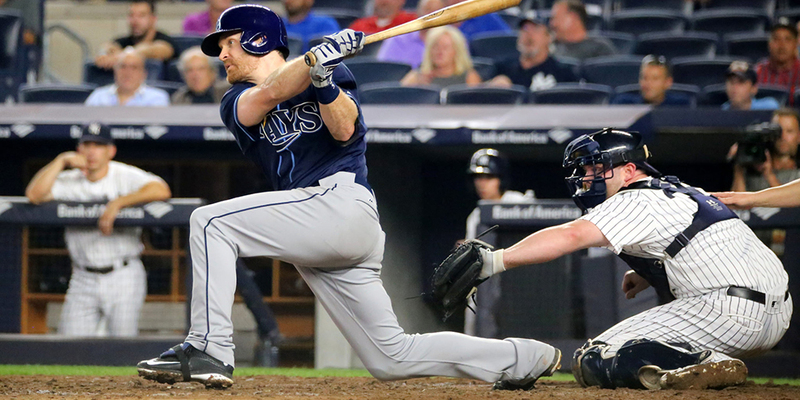 After almost three months of searching, they acquired Logan Forsythe from the Tampa Bay Rays for right-handed pitcher Jose De Leon in a rare 1-for-1 deal. I identified Forsythe as a possible second base option early in the offseason. Obviously, Archer and Longoria aren’t in this deal, but that doesn’t diminish the fact the Dodgers got a solid second base option for the next two seasons. Forsythe, 30, fits into the Dodgers’ 2-year plan perfectly. He’s signed through this season at $5.8 million and carries a team option for 2018 at $8.5 million, which will be picked up provided he doesn’t fall flat on his face. They also have the option of picking up the option and moving him if he falls out of favor or doesn’t fit as well as perceived. I suspect that won’t be an issue, though. Over the last two seasons, Forsythe has been a Top 10 second baseman in baseball. He has a .273/.347/.444 triple slash with an above-average .171 ISO and 6.8 fWAR. He also has the same wRC+ (119) that Dustin Pedroia has over the same time period. Last season, Forsythe missed a four weeks with a fractured scapula, limiting him to just 127 games. He sold out a bit more for power, posting a career-high ISO of .180, and that came with a career-high strikeout rate of 22.4 percent. Conversely, his HR/FB rate jumped 5 percent due to hitting fewer fly balls (5.4 percent) than in 2015. His pull percentage was identical in both seasons, and he hit fewer balls softly (11.7 percent) than he did in ’15 (15.2 percent). That’s a correlation to an increase of 1.7 MPH in exit velocity from ’15 to ’16. His contact rate suffered a bit, but it was still a strong 79.4 percent. The fact his BABIP didn’t plummet is encouraging. Defensively, Forsythe grades out decently in the metrics. He was better last season, but over the last two seasons, he’s fifth among qualified major leaguers in defensive runs saved (nine) and 12th in UZR/150 (-1.0). Inside Edge fielding has him as a Top 10 guy in plays with a 10-40 percent chance of being made. In plays with a 40-60 percent chance, he’s just 18th among second basemen. That isn’t terribly surprising since he’s not known for his range at the position. He was also involved in 16 more double plays than Chase Utley was last season in 36 fewer defensive innings. Forsythe was acquired by Andrew Friedman in Tampa from the Padres in the Jesse Hahn deal, in which the Rays also received Brad Boxberger in one of Friedman’s best trades with Tampa. Thus, there’s some sense of familiarity with who the Dodgers are getting in the clubhouse with Forsythe as well. Ever since the Andrew Friedman–Farhan Zaidi front office was born, it has been reluctant to trade big-time prospects for proven veteran commodities — until now. De Leon is the highest-rated prospect the Friedman-Zaidi regime has traded, as he is a global Top 40 prospect in baseball. The front office duo previously traded Grant Holmes and Frankie Montas in August for Rich Hill and Josh Reddick, but Holmes was ranked only as high as 40th (Baseball Prospectus) before the season, while Montas was ranked as high as 95th (MLB.com). The Dodgers have used their prospect capital to acquire one of the better second basemen in baseball. Forsythe’s on an affordable contract, has lots of power and vastly improves the team’s ability to hit left-handed pitching. They gave up a quality guy in De Leon, but he’s not irreplaceable. De Leon is a legitimate prospect and he should fit in well in Tampa Bay. He has come a long way from being a 24th-round pick in 2013. The trade eats into the Dodgers’ starting pitching depth a bit, but as I wrote last month, they could afford to do just that to acquire one of the best power-hitting middle infielders in the game. It’s a bonus they were able to keep Brock Stewart, though. While Brian Dozier would have been a better option, he also would have cost more in trade, as evidenced by the fact that deal never got done. The Dodgers were never trading De Leon, Yadier Alvarez and more for Dozier. Instead, they’ll ride into the season with Forsythe at second base and less one starting pitcher, not two. The Twins were right to not settle for just De Leon for Dozier, so the Dodgers found a team willing to do a 1-for-1 swap involving De Leon instead. Now, find a late-inning relief option and get ready for spring training.